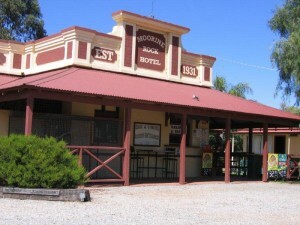 Located 22 kilometres west of Southern Cross on the Great Eastern Highway Moorine Rock has a general store and school. Newly refurbished motel with 3 ensuite motel rooms with queen bed, 3 rooms with shared ablutions and 6 rooms donga style accommodation and East Wing Unit – suits family of up to 8. Country meals available in a country pub. Garden bar which is ideal in the summer months. Small group bookings. Located just off Great Eastern Highway, 5 minutes from Moorine Rock and 20 minutes from Southern Cross on Moorine South Road. Self-contained three bedroom farmhouse with two double bedrooms and a third room with two single beds. Family room with additional beds on request. All with electric blankets. Linen and towels are provided. Shower and bath, separate toilet and laundry facilities, air conditioning and wood fire with wood supplied. Fully equipped kitchen and dining room. Prices below include self-catering breakfast. Comfortable living room with TV and DVD. Outside entertaining area with gas BBQ. Children’s playground. Farm animals and experiences. No Pets. Our Luxury Tent accommodation is a 8 x 3.5 metre quality canvas tent mounted on wooden decking. It consists of 2 main rooms and a covered deck with an outdoor setting. A gas bbq is provided for cooking with all crockery, cutlery and cooking utensils provided. Phone enquiries for camping and caravanning. Home of the unique annual June dog sled event the “Hampton Hoon”. Located 51kms south of Moorine Rock. Hampton View offers a variety of accommodation options including The Farmhouse, the Quarters, the Shearing Quarters, the Miners Den and camping sites. Tours of the farm available, check out the machinery, visit the farm animals and search for wildflowers during season. Meals are available by prior arrangement. Check the website for tariffs and availability.